Only 6 months old from rooted cuttings. The tree is about to be installed in expanded clay pebble media. (See the finished photo below.) The 1/2" plastic tube is for checking the water level with a pipette. It is anchored at the bottom in a bottle cap that has a 1/2" hole to fit the tube. 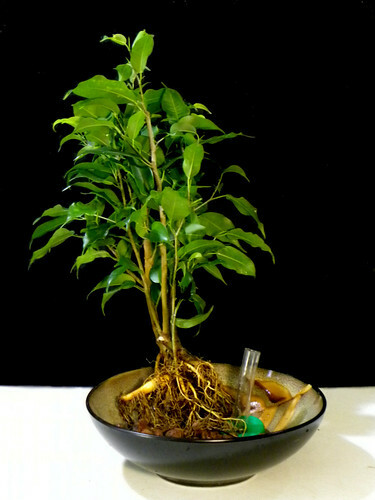 This Ficus tree was propagated from cuttings just six months ago. It is the same tree in yesterday's post. Today I removed the soil from the roots and converted it to hydroculture in expanded clay pebble media. It now lives in an inexpensive ceramic rice bowl in bonsai style. 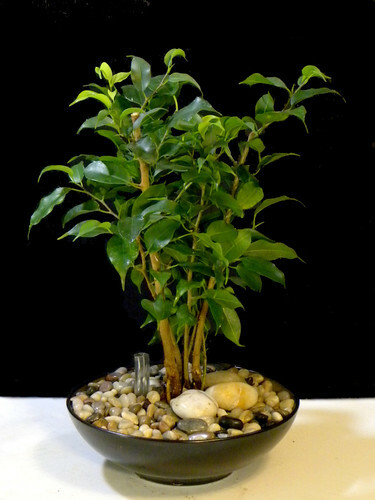 If not for the fact that I do applied research on soil media plants, I would convert all of the 70 Ficus trees in my collection to hydroculture. If you are interested in the art of indoor Ficus bonsai, Jerry Meislik aka "bonsaihunk" is a well recognized master of the art. There is a wealth of information on his site. Click on the photos for a larger view on Flickr. The 1/2" clear plastic tube is for checking the water level in the clay pebble media. Normally I would cut it close to grade level. I left it longer so it would be visible in the photo. Simply insert a piece of 1/4" clear plastic tube to the bottom. Hold your finger over the top end and lift. You will be able to see the exact level of water in the planter. This is called a pipette. I also installed a layer of polished pebbles over the top of the clay pebble growing media. Most people looking at this plant would assume it is growing in soil media. No soil, no drain hole, no waste of water and time...and no problem growing a healthy little bonsai that can last for generations to come.